Post on down-regulation and switching conflict styles as a way to do that. Thanks for signing up. See you Tuesday, January 29 at 1230 Standard Time! Comprehensive Guide. This comprehensive Trainers Guide to Successful Conflict Styles Workshops is now in its 4th edition. The 2019 update is the same as previous editions, now newly editing for clarity and ease of use. The 40 page guide provides detailed guidance for training with Style Matters and many options for presenting information and leading discussion. Download the Trainers Guide in PDF free here. Guide to Online Version. We’ve also just released a 10 page companion piece, Trainers Guide to Style Matters Online. 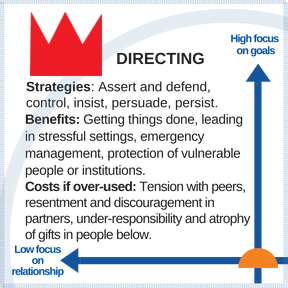 Whereas the above guide provides detailed guidance on all aspects of conflict styles training, this short guide focuses narrowly on work with the online version. If refers often to the full guide, so you should have both. Download the online training guide here. A key part of the Riverhouse mission is to enable anyone with basic group facilitation skills to lead an effective learning experience on the topic of conflict styles. Every person, every organization, and every community faces conflict throughout the life cycle. We believe that failure to equip people to deal constructively with conflict is one of the greatest obstacles to human well-being. We also see addressing this gap as one of the most achievable opportunities to improve human life in fundamental ways. These trainers guides are central to our mission of supporting the emergence of trainers on a large scale to address this glaring learning gap. 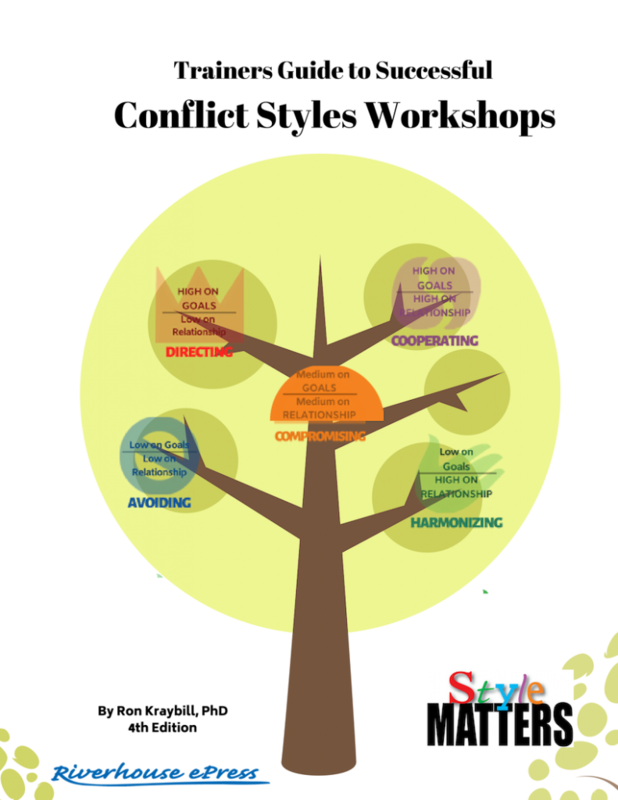 Trainers considering Style Matters as a conflict style inventory should be aware of two other options as well, the Thomas-Kilmann Conflict Mode Instrument and the Hammer Intercultural Conflict Style Inventory. 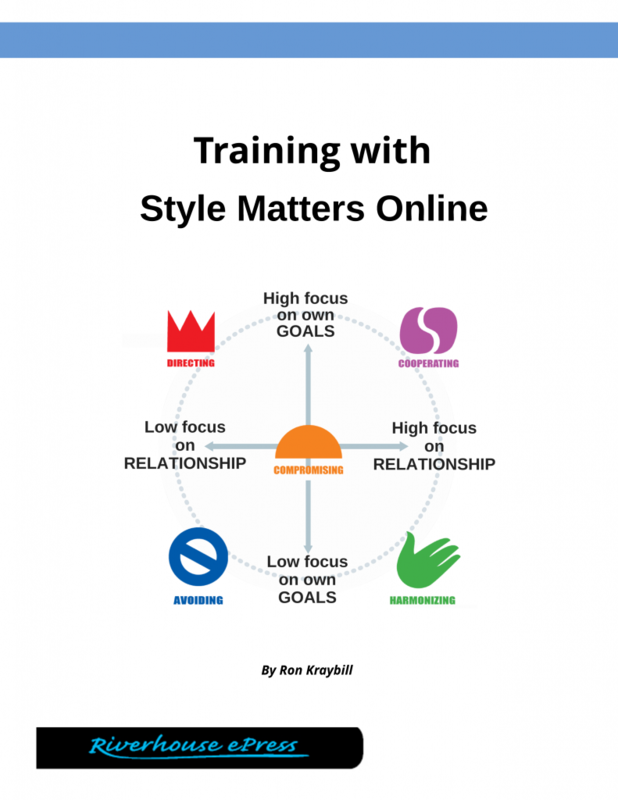 Style Matters has been optimized for the majority of conflict resolution trainers. But a percentage of trainers might benefit from a specialized tool. Optimized for psychometrics. The Thomas-Kilmann Conflict Mode Instrument, also known as the TKI, was developed in the 1970s with a priority on psychometric validation. The Thomas-Kilmann is noted for its commitment to psychometrics, reflected in its commitment to the use of a question format that forces users to choose between only two possible options in responding. Although some users find this format annoying, authors Thomas and Kilmann retain it because it results, they say, in more accurate data. For a description of my own experience with the TKI, see my blog post on it. If psychometrics is your over-riding concern, and issues such as user friendliness, cultural flexibility, and cost have little bearing for you, the Thomas-Kilmann is probably the right choice. Cost is $19.50 per user. A trainer’s guide is available for $250. Optimized for cultural analysis. 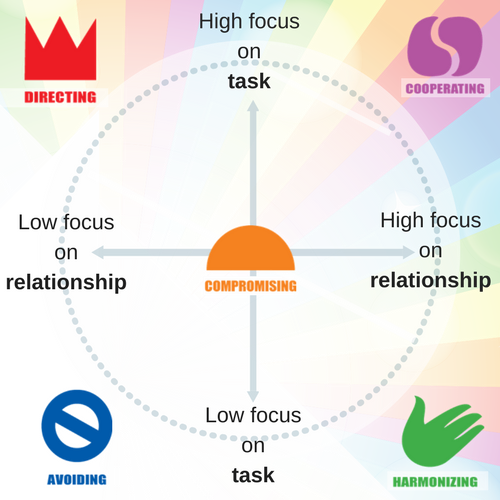 The purpose of Mitch Hammer’s Intercultural Conflict Style Inventory is building capacity to understand cultural differences and do conflict resolution across cultures. Its questions and interpretive frameworks all revolve around this. If that’s your primary objective, there’s no better tool. The ICSI ranges in price from $16-$22 per user. Optimized for Learning. As a trainer with academic background and deep commitment to building cross-cultural understanding, I care about psychometrics and cultural issues. But for me and, I believe, most trainers using Style Matters, those are not the key priorities in training. I’m not interested in making definitive pronouncements about how people function in conflict and I discourage trainers from this. Rather, I want to give people a framework for evaluating dynamics of conflict, reviewing options, and making wise choices. For that purpose, trust in the tools of learning is a more important requirement than supreme psychometric reliability. That means arranging questions in ways that are not off-putting to users. Nor am I interested in full-blown cultural comparison in most of the training I do. I simply need a conflict resolution training tool that people from a variety of cultural backgrounds feel comfortable with. In developing Style Matters, I prioritized teaching effectiveness. I needed a tool that I could rely on in all kinds of settings to give learners a high quality learning experience. I wanted a simple, powerful tool to help learners think through their options in conflict, that gave highest authority to self-reflection, discussion, and feedback from others rather than to “rock-solid metrics”. And it needed to be cost affordable to all the groups I worked with. Although I had used the Thomas-Kilmann for several years and experienced its usefulness, I was frustrated by the resistance I regularly encountered around the wording of questions. I was also troubled by the discomfort of many participants from backgrounds outside the white, educated North American backgrounds of its authors. You can read more about this in my essay here. Independent researchers did psychometric evaluation of Style Matters in 2007 and helped us tweak it for psychometric validity and reliability. But we signal users throughout that their own self-assessment and the feedback of those who know them well are what really count in determining their patterns. Numbers on a test are the first stop on a journey of self-awareness; they should not be considered the final destination. Want to lead a conflict styles workshop? 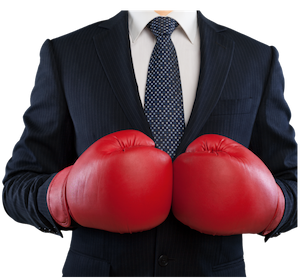 Join me on November 21 for the first in a series of short webinars, Training with the Style Matters Conflict Style Inventory, I’m leading for trainers. I’ll give input for about 15 minutes and we’ll have about 15 minutes open for questions. As the first run of this series we’re offering this free. Seats are limited. Register now! Enter your name and email address and you will then receive a confirmation email with info for joining the webinar on the 21st. Everywhere I’ve lived and worked, I’ve met people who feel a deep inner echo to the idea of making peace. I’m a bit mystical about such things. An inner echo is one mark of a calling and I have a lot of time for people hearing it. View a job in conflict resolution and peacebuilding as a long-term objective. Almost nobody gets a degree in conflict resolution and then walks straight into a job in the field. You prepare and position yourself, you build experience and relationships, and if you are fortunate a path opens. Usually slowly. Which means that, unless you are independently wealthy, you need to…. Maintain at least one area of expertise or credentials besides peacebuilding. Most people with a job in conflict resolution subsidized their interest for a number of years with something else. It takes a while to build up experience and a reputation in conflict resolution. In the meantime you’ve got to eat. Whether law, social work, editing, teaching, web freelancing, pastoring, or carpentry, you’ll probably need something else to live on. This is not a bad thing at all. There’s more than financial reasons to have a second set of credentials. The path to full-time work in conflict resolution often runs through something else you’re already good at. People in conflict don’t want just any old mediator. They want someone competent in the area of their disagreement. Businesses want assistance from someone who understands business; schools, an educator. Religious organizations want “one of us.” International organizations seek facilitators, trainers, and consultants with deep knowledge of a region or relevant disciplines. So expertise in another area gives you your best opportunities for building a career in conflict resolution. Even if you cannot yet credibly present yourself as a resource on conflict resolution, you can still advocate for creation of structures and processes for constructive resolution in the settings where you are connected. Start a playground mediation program in your school if you’re a teacher, encourage clients to explore mediation if you’re a lawyer, counsel a client in dealing with a conflicted family if you’re a social worker, lead a workshop on conflict resolution for a group of youth if you’re a youth worker. One great way to start is by leading a conflict styles workshop. 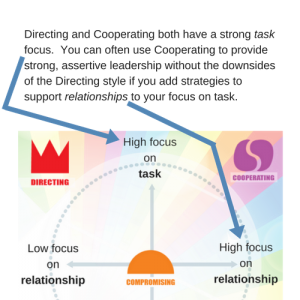 Groups and teams of all kinds benefit from spending an hour or two reflecting on conflict style preferences of individuals in the group. So long as you are comfortable with basic group facilitation you don’t need to be a conflict resolution expert to lead a successful learning experience. 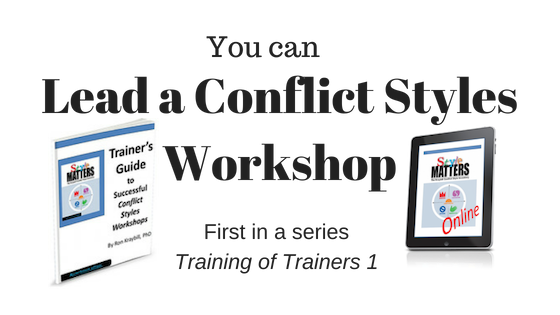 Download my free “Trainers Guide to Successful Conflict Styles Workshops” for help in designing the workshop. You’ll make mistakes, of course, but you’ll learn fast! If you enjoy it and others respond well, you’ll want more and you’ll find ways to do a repeat. Over time, more and bigger doors will open. Expand your vocational goal from mediator to peacebuilder. Mediating is a narrow go-between role, often constricted by professional or social expectations, for which there is limited need in our world. Peacebuilding is a way of being and contributing to constructive resolution of conflict that can find expression in any number of roles and functions. There will never be enough peacebuilders because human beings are diverse and therefore conflict is inescapable. You might find, if you are, say, a lawyer, that you love being known for handling legal cases in ways that encourage early settlement. An administrator might take deep satisfaction in becoming highly effective in managing staff disputes. Even if you are sure you wish to end up working fulltime as a mediator, one of the best things you can to do open doors for that is to become known in your existing profession as someone with great conflict resolution skills. 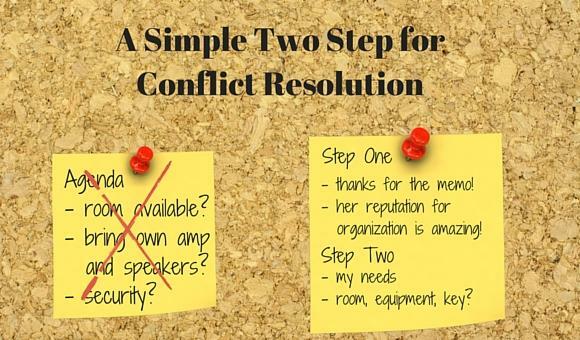 Conflict resolution work almost always involves the creation of new processes and structures. You have to advocate unusual ideas, develop proposals to get approval and funding, draft reports, create summaries. All have written communication at their core. So at a minimum, commit yourself to the hard work involved in learning how to write clearly and simply. I learned early in group work that anytime I could figure out a way to enable people to move and locate themselves physically in relationship to the work we were doing, transformative things happened. I figured out a small kit of tools (Spectrum, Fisbbowl, Samoan Circle, Talking Stick, etc.) that I got good at using on a moments notice and can easily incorporate into whatever work I do – whether planning, group dialogue, or business meetings. You will get farther in your career if you master your own small kit. Get my compact Cool Tools for Hot Topics for a quick $5 how-to, but there’s lots out there free on the web. This is a recent and still tentative learning based on the eye-opening education I’ve received marketing my Style Matters conflict style inventory. Seemingly unnoticed by people in the worlds of social change, peacebuilding, community development, and human rights, a transformation is taking place in how businesses reach buyers and clients. Many successful online businesses now avoid the loud, attention-getting sales strategies once considered necessary to sell. Instead they invest in listening carefully to the people who use their products. They give away a lot of useful knowledge and services for free. They emphasize collaboration and networking. People come to view such businesses as helpful and trustworthy and don’t need to be persuaded to buy. Clear strategies and tools have emerged in the business world with tremendous potential for peacebuilders and other agents of social change. Do a search on “inbound marketing” for resources, many of them free, at least for small users. Two of my favorites are hubspot.com and smartpassiveincome.com. Look at Craig Zelizer’s Peace and Collaborative Development Network for a rare example of inbound marketing in the social change world. Lots of freebies there – good ones that clearly respond to needs. Extensive use of social media. Blogging. Networking in all directions. Obviously the site requires revenue and generates some – ads, requests for support – but revenue generation doesn’t dominate. And no, you don’t have to be as big and ambitious as that site to benefit from inbound marketing approaches. Get a foundation in community development. This is especially true if you aspire to international work. The cutting edge in peacebuilding internationally lies at the intersection of peacebuilding and development. Reflect that awareness in your career path and you will be more credible to agencies doing serious peacebuilding work. The single best career advancer for someone interested in international peacebuilding would be to spend several years in development work, paid or volunteer. But do not make the mistake of targeting the large, monied international organizations that are widely considered the pinnacle of international work as your ultimate career destination. You will pay dearly to elevate yourself in such organizations, in currencies that are priceless – the health and stability of your personal relationships (“Consider the UN your wife,” a senior UN peacebuilder once advised me, not in jest), your rootedness in community, your peace of mind about structures of our world, your contentment with your soul. This is not advice against a sojourn in such organizations, but rather a caution against staying too long in them or assuming too much regarding what can be achieved there, how you will be treated, and how you will feel about your life as a result of your time there. Go with your eyes wide open and pay attention to what is happening in your heart over time. Copyright Ron Kraybill 2016. All rights reserved. May be reproduced so long as this statement of authorship is included and links are made to http://www.riverhouseepress.com/blog/career-in-conflict-resolution/. Ron Kraybill has worked as an in-residence peacebuilding advisor and trainer in South Africa, Lesotho, the Philippines, Ireland and other locations for the United Nations, Mennonite Central Committee, and other organizations since 1979. He now resides in Silver Spring, Maryland, trains and consults in support of national peace processes, blogs at www.KraybillTable.com and publishes the Style Matters conflict style inventory at riverhouseepress.com. © Ron Kraybill 2016, 2018.www.RiverhouseEpress.com. May be reproduced or reposted if this attribution notice is included. An Important Choice: What to Do and Say After Violence? 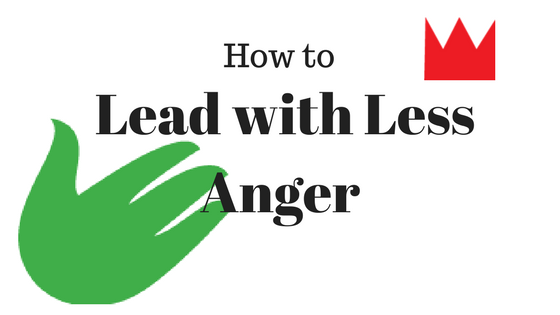 Whenever violence takes place as a result of public conflict, well-intentioned leaders face a challenging question. How should they respond? What should they say that might reduce possibility of further bloodshed? They can learn from the tragic experience of the Yugoslav Wars in the Balkans in the 1990s where some 130,000 were killed in a decade of horrific genocidal conflict. Most of the combatants were religious, loyal to the eastern or western branch of Christianity or to Islam. All three traditions are home to resources for peace. Each has scriptures that affirm kindness and peaceful conduct. Each has individuals deeply committed to peaceful coexistence with others. Yet religion played a central role in the violence in the Balkans. And religious leaders often contributed to the violence rather than help end it. One way religious leaders stoked the war was through public comments on the conflict that superficially seemed to support peace but actually stirred followers up and ultimately supported an upward spiral of violence. Although Appleby writes about religious leaders, his observations speak to all leaders sincerely committed to helping communities and nations end upwardly spiralling violence. 1) You must speak out against violence when it occurs. Silence will be interpreted as permission to continue. 2) If people from your group or aligned with you have been violent or are seriously tempted to violence, it is imperative that you acknowledge this and publicly address it. Failure to do this will be understood as license to continue violence. 3) General calls to all for peace and good conduct have positive value only to the extent that you display deep commitment to constructive behavior by those “on your side”. If you don’t specifically challenge your own allies to high standards of conduct, they will inevitably sink to low ones. 4) Unless you are scrupulously doing the above, public criticism of the excesses of the other side only fans the escalation of violence. 5) The ability to do the above constructively will be much higher if you establish personal friendships with some leaders in communities in conflict with your own. Try out on them the responses you anticipate making publicly about the conflict. You will probably be surprised by gaps in your understanding of what is happening. The quality and constructiveness of your responses will rise.